That would be very interesting if he truly managed to detect the presense of B-2 , most certainly he managed to track and beat a F-117. What chance have the Russians of tracking B-2s when American marketing and propaganda are so strong? I am sure the Russians are not dumb and they must be worked out or atleast tried to work out tactics to detect a B-2 as they represent a real threat to them. Only as a first strike weapon are they a threat. And in a first strike you can't send up air support as that would give away the surprise. We hear about how this stealth plane has a radar signature of a tennis ball or that stealth plane has the radar signature of a small bug. The Russians track paint chips in space. There are not that many tennis balls or insects for that matter that fly at 12,000m at 700km/h. OTH radars actually have several advantages in finding stealth aircraft... their low frequency plus the fact that they bounce off the atmosphere around the curvature of the earth means they likely wont hit the stealth aircraft front on, but from the top or bottom... angles from which they are not so stealthy. Let put the question this way , Do you think the Russians have any thing in their inventory that can detect a B-2 even if it flew close to Russia ? Their BMEW radars would detect them for the same reason the Aussie OTH-B radars detected them. All Russian fighters have IRSTs and IR guided missiles and cannon. The Rapier system EO detecting a B-2 is no big deal becuase it over flew it in the airshow , it knew where and what to look at and they pointed the EO towards it. The B-2 stood out clear as day in the IR system, the Russians have optical tracking systems in addition to radar systems too you know. I would say B-2 strategic bombers represent a far bigger challenge to RVSN or Strategic Forces then any Minuteman or Ohio does when it comes to first strike. I disagree. With Humint resources within NATO and the US as I said a B-2 would be incredibly vulnerable to even an old fighter like a Mig-21 let along a more modern one like a Mig-29 or Su-27 or Mig-31. An SS-18 is less interceptable than a B-2... there is no chance that a B-2 strike could wipe out Russians entire nuclear forces or even weaken it to the point that a retaliation could be survivable. It would just be one way to start the end of the world... despite their price they offer no silver bullet that the US can use to make demands or hold over the Russians. The Mathematics of stealth were created by a Russian and while the processing power of computers has increased enormously the maths hasn't changed much at all. The difference between the F-117 and the B-2 is that the B-2 has curves thanks to super computers processing power and manufacturing methods that can produce products to the level of accuracy required. If there were 100 B-2s then they might make a difference but there being only 20, and their locations being pretty much known and monitored they are not the threat in real terms you seem to think they are. In 2012 Russian military will receive first Nebo-M AESA radar complexes, which pass all state tests. Nebo-M consist of 3 AESA radars, which work in different wave lenghts. Can we have a list of Russian air-force radars in use? Those are only the radars that I've conclusively ID'ed at dedicated EW/GCI sites. SAM-related radars like the 64N6 aren't included. I've recently located 59N6 radars, you can add those to the list. I'm also rechecking placemarks to ID individual radars. The numbers are going into a spreadsheet, I'll post the final totals of each radar when I get through everything. Here are the numbers I've come up with for deployed radars. 1. These are only radar systems I could positively identify. 2. These are only radars found at EW sites that I have identified; I'm not trying to imply that there aren't any more of them out there! It's interesting that there are a lot of older systems still around, but they're mostly used by airfields for GCI or traffic control. Obviously you can't tell if they've been upgraded simply by looking at satellite overheads. Likewise, there are a lot of EW sites using protective domes for the radars, can't tell what's inside those. Many of the newer radars exhibited or offered by Rosoboronexport/Rusarm simply don't seem to be found in service anywhere apart from the 59N6 and 55Zh6. I remember reading somewhere that the VKO or new Aerospace defence forces were standardising on two main mobile radar systems. I would expect because they were only created in December last year that they might take a short period to get their act together and start replacing the mobile radar network they control. New Nebo-M radar at VVS 100 years anniversary. At the Aero-India 2013 Russian company NNIIRT has introduced an export version of its 1L121-E mobile 3-D air-defence radar. Sujoy wrote: At the Aero-India 2013 Russian company NNIIRT has introduced an export version of its 1L121-E mobile 3-D air-defence radar. Nice article about the radar. Viktor wrote: Nice article about the radar. Exactly and a great picture too . Thank You . MOSCOW, February 15 (RIA Novosti) - Russia’s air-defense systems manufacturer Almaz-Antei will for the first time show mockup models of advanced battlefield surveillance radar systems at the IDEX-2013 international arms exhibition in Abu Dhabi, the company said on Friday. Almaz-Antei will display models of FARA-PV, a modernized, portable short-range battlefield surveillance radar with a panoramic display, and Project 1L277, a short-range solid-state ground surveillance radar. The radars are designed for day/night and all-weather location of moving targets (personnel and vehicles) and stationary objects. They feature automatic transmission of data to the user and can be used to adjust artillery fire. Project 1L277 can track up to 20 targets and is capable of automatic moving target recognition. Representatives of nine defense firms affiliated with Almaz-Antei will take part in the exhibition. IDEX-2013 will run from February 17-22. The ultimate anti-missile gun system. 80 barrels throwing up a metal storm. I think we need only one such topic where we will discuss all sort of Russian radar systems. Now Russian radar systems are spread among numerous other topics and the whole situation is not clear. So to start I have one interesting topic that emerged today. OTH radars 'Konteyner' developed by Niidar. 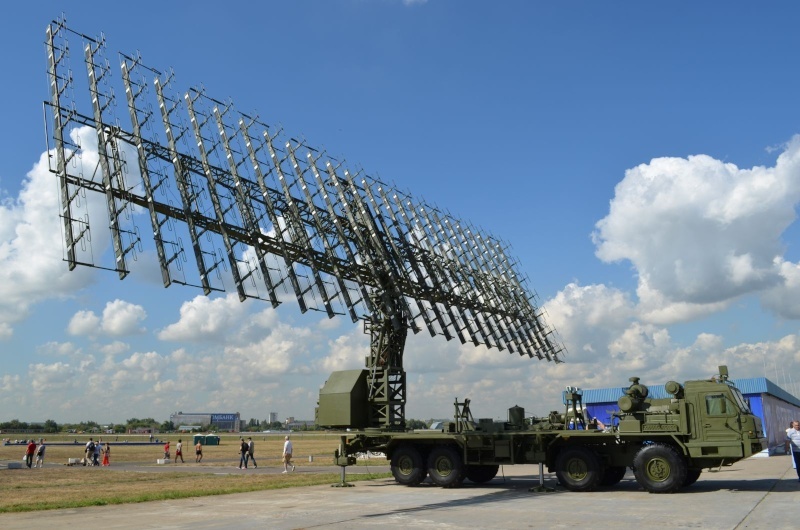 The Ministry of Defence of Russia began to create a network of radars that allow for airspace surveillance within a radius of three thousand miles away. According to the source , "Interfax" in the heart of the new radar systems will be "Container". launches of intercontinental ballistic missiles. The main objective of "containers" to the identification of small-ship cruise missiles and unmanned aerial vehicles. New radar sets deployed although it is not clear which type and how many. Up to 30 new radar sets should be delivered by the end of this year. I think russian moD will buy a lot of new radars for all military districts. You prempted me by like 30 seconds.Damn you Victor! TR1 wrote: You prempted me by like 30 seconds.Damn you Victor! Was thinking the same. Perhaps Algeria? Russia now adds one 96L6 per battery to increase flexibility in case 64N6 gets destroyed for whatever reason. Wait I thought 96L6 was the "standard" search radar, and 64N6 was the additional bonus? Mixed up 96L6 and 92N6. And as many times before we can only guess what types might those be.